Learn Salsa in No Time, Anytime, Anywhere! Top-Notch Instruction - Superb quality Videos! Music is such an integral part of the dance! Salsa Grooves is an interactive software tool that finally makes it easy to teach and learn how to better understand and connect with the music. This results in quickly improving your timing and musicality! Fine-tune your ears and never feel lost in the music again! What do all great dancers have in common? Perfect timing and amazing interpretation of the music! Their secret? Understanding of Salsa music. 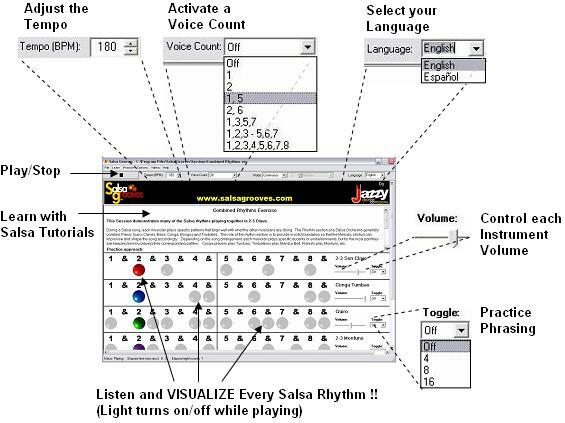 Salsa Grooves is an easy-to-use software that allows you to quickly improve your timing and musicality! Every Salsa song is made up from the same components / rhythms. Learning to recognize them will open endless possibilities for expressing your dancing in any song. No more counting 1,2,3...5,6,7. Let the music guide you! Salsa Grooves' unique VISUAL approach makes learning Salsa Rhythms a breeze! Salsa Grooves combines the benefits of Timing CDs, music books and Salsa videos in one easy-to-use software. Listen and Visualize Salsa Rhythms! Salsa Grooves includes a unique graphical interface that allows you to visualize and interact with the Salsa rhythms. It makes learning and practicing easier than ever. Salsa Grooves includes several short clips that demonstrate how to practice your footwork, styling and partner work using the software. Learn the fundamental building blocks of Salsa music. Each tutorial takes about 15 minutes to complete. Once you know the theory, you'll know what to listen for! Tutorials include Clave, Tumbao and more! Being able to recognize the different rhythms played in a song is fundamental to improving your connection to the music and expressing yourself more freely. Salsa Grooves allows you to control the volume of each rhythm independently. This allows you to fine-tune your ears to the rhythms of your choice and be ready to identify them in any song! Click here to read about how to use Salsa Grooves to fine-tune your ears and feel more connected to the music! How can Salsa Grooves help me? Salsa Grooves allows you to quickly recognize the fundamental rhythms present in every Salsa song and allows you to develop your ability to accentuate with your body the rhythm of your choice!